The demand for the debut issues of two of Image Comics’ newest comic book series, SAGA and THE MANHATTAN PROJECTS, has been so strong that the publisher has already ordered third printings for both titles. SAGA #1, the first issue of the new Image Comics series by Brian K. Vaughan and Fiona Staples, sold out a week before its March 14 in-store date. It got near-universal rave reviews. And yet even Image was caught by surprise when the orders for the issue’s second printing were double the print run. The issue has immediately gone back to press once again, and the third printing (FEB128166) will be in stores on April 25. 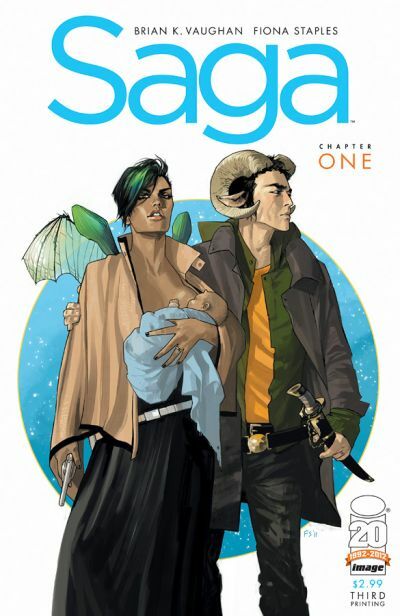 The reprint print run for SAGA #1 was more than twice the usual quantity for second printings, but orders from retailers eager to get the critically-acclaimed first issue in the hands of customers kept rolling in, making a third printing necessary before the second printing is even in stores. “Saga is the kind of comic that you get when truly talented superstar creators are given the freedom to produce their dream comic,” wrote Entertainment Weekly’s Jeff Jensen in his review of the issue. SAGA tells the story of a young family, caught between two sides in a galactic war, striving to find safety for their newborn daughter. It is a monthly full-color comic book. The second printing of SAGA #1 will be in stores on the same day as #2, April 11, and the third printing will be on sale on April 25. 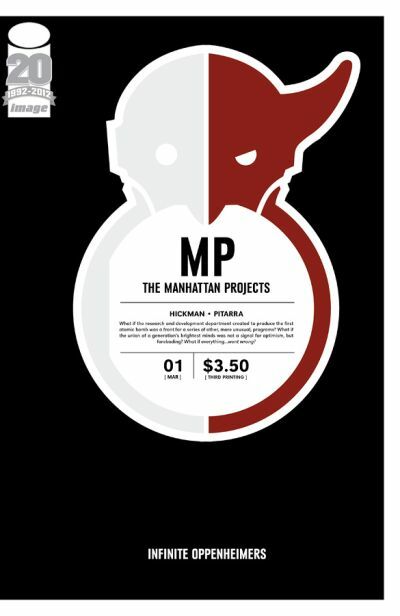 THE MANHATTAN PROJECTS the newest Image Comics series by Jonathan Hickman and Nick Pitarra also has a first issue that is receiving a third printing after orders for its second printing surpassed the print run. A story in the print and online versions of USA Today and rave reviews accompanied the series debut on March 7. “The Manhattan Projects is off to a tremendous start, one of the big concept author’s strongest, most inventive opening chapters,” wrote Paul Montgomery in his review at iFanboy. THE MANHATTAN PROJECTS creates an alternate reality where the real-life project to develop the atomic bomb is just a front to hide far more bizarre government programs. The creative team of Hickman and Pitarra previously collaborated on THE RED WING, also published by Image Comics. THE MANHATTAN PROJECTS #1’s second printing will be on sale on April 4, with the third printing (FEB128156) following on April 18. THE MANHATTAN PROJECTS #2 will be in stores on April 11.